We study the structure, molecular recognition and dynamics of biomolecules in solution using Nuclear Magnetic Resonance (NMR) spectroscopy, combined with complementary structural biology and biophysical techniques.Biomolecular NMR is a powerful technique not only for determining the three-dimensional structures at atomic resolution but also for characterizing the interactions and dynamics of biological macromolecules in solution. Advances in NMR methodology and instrumentation allow high molecular weight multi-domain proteins and complexes to be studied. We are also applying NMR as a tool in chemical biology and drug design, i.e. for studying interactions and the modulation of conformation and/or function of proteins upon binding to small molecules. A main focus in the Sattler group is to understand the structural basis of regulatory protein-RNA interactions that are functionally important for various aspects of gene expression, such as the regulation of (alternative) pre-mRNA splicing and gene silencing by non-coding RNAs (siRNAs, miRNAs). More than 90% of human multi-exon genes are alternatively spliced and misregulation of splicing is linked to various human diseases. Early and critical steps in the regulation of alternative splicing involve the binding of trans-acting factors to the pre-mRNA to modulate the splicing decision. These are multi-domain RNA binding proteins that mediate dynamic molecular interactions, where specific and tight complexes are formed by the cooperative combination of multiple weak protein-protein and protein-RNA interactions. Current projects focus on protein-protein and protein-RNA interactions that play important roles in the recognition of the 3' splice site by U2AF and SF1 required for constitutive splicing and in alternative splicing of Fas pre-mRNA by binding of alternative splicing factors, such as SPF45, TIA-1 and RBM5..
Another area of research is structural investigations of proteins and protein complexes in peroxisomal biogenesis, in the regulation of eukaryotic chaperones and disease-linked cellular pathways. Here, we focus on understanding the structural basis, dynamics and allosteric effects that underlie the molecular functions of these proteins. NMR is well suited to study such dynamic and transient interactions in solution. We are implementing and developing integrated structural biology approaches combining NMR-spectroscopy and Small Angle Neutron and/or X-ray Scattering (SAXS/SANS) data with crystallographic information to investigate molecular mechanisms involving high molecular weight protein complexes in solution. We have established infrastructure and expertise in structure-based design of small molecular inhibitors as i) starting points for pharmaceutical interference and ii) as tools to modulate and monitor cellular signaling. These studies aim at identifying optimized small chemical compounds using structure-guided approaches. 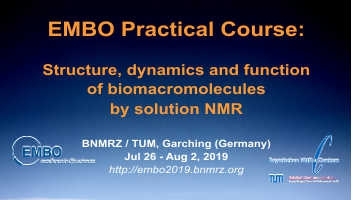 NMR is an efficient tool for such a structure-based approach since it not only allows to determine the three-dimensional structures in solution but also is efficient in detecting and mapping ligand binding of biomolecules. We combine NMR with X-ray crystallography and computational methods for these studies.